How Can We Correct Your Vision While You Sleep? A rigid, gas permeable contact lens reshapes your cornea while you sleep. You wear the lens overnight, take it out in the morning, and have great vision all day long. The FDA approved Paragon CRT for up to -6.00 diopters of myopia (nearsightedness) and up to -1.75 diopters of astigmatism. There are no age restrictions and CRT has been clinically shown to decrease progressive myopia in children and adults. 1. At the initial evaluation, careful measurements of your eye shape and prescription are taken. 2. The doctor will order an initial set of lenses based on these measurements. 3. In approximately one week, the lenses will arrive in our office and be ready for your first fitting. 4. The lenses will be checked to be sure they rest properly on your cornea. If the initial set of lenses fits well, you will be taught the proper techniques for handling and wearing these unique lenses, and will wear them overnight. 5. The next morning, you will return for an evaluation of the vision and fit. If the initial pair of lenses do not fit exactly as they should, a second or third pair may be necessary. You will not be asked to wear the lenses unless they are fitting perfectly. 6. After the initial fitting, typically a one week , one month, three month and six month evaluations are necessary to track your progress. 7. Annual reevaluation is required to guarantee continued corneal health. Initial CRT Fitting, Follow-Ups, and Lens Cost for both eyes is included in the fee. CRT is approximately 1/3 of the price of LASIK, and since it is non-surgical, there are very few risks. Yearly CRT Evaluation for Fit and Corneal Health is highly recommended at a minimal fee. 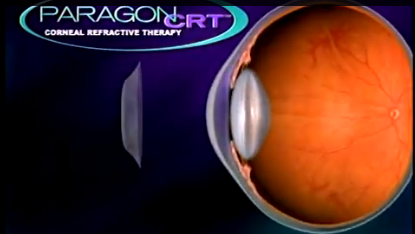 CRT Lens Replacement for Lost or Damaged lenses is only a quarter of the cost. Dr. Richard Malara & Dr. Matthew Durkin are Paragon CRT® Certified to perform Corneal Refractive Therapy. -6.00 diopters of myopia (nearsightedness) and up to -1.75 diopters of astigmatism. There are no age restrictions and CRT has been clinically shown to decrease progressive myopia. Call for an appointment TODAY to see if you are a candidate! Read an actual testimonial from one of our Corneal Refractive Therapy (CRT) patients. It has been reproduced with her written consent. “I always wanted to not have to wear glasses or contacts but the thought of eye surgery scared me. But I thought there is not other option? But there is CRT…wearing contacts at night while sleeping corrects my vision while I am sleeping and I wear NOTHING during the day. I have been doing CRT for over a year…I wear them every 3 days at night…have gone as long as 7 days, and my distances has gotten a little blurry but still can see ok. I have had really bad allergies in the past and was not sure how the CRT would work but it has and continues to work great for me.